Are you a huge fan of slingo games? 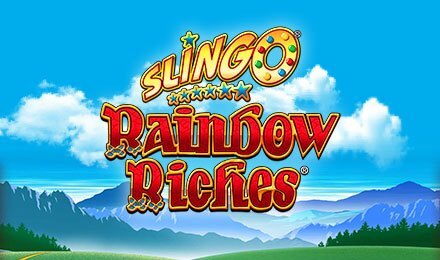 If so, you should try your luck on this interesting casino slot called Slingo Rainbow Riches. The slot offers a handful of spectacular graphics and extraordinary gambling experience, as well as some top-notch sounds playing along. Sure, this game might appear a bit strange, but you will actually find it exciting and original. It even takes the titular brand to a whole new level. If you want to know more about how to play slingo, then you have come to the right place. This Slingo Rainbow Riches review can help you win big time! The Slingo Rainbow Riches comes with a game card that offers a grid of 25 numbers in what is a 5x5 grid. As you go to play slingo or enter your slingo login, you are given at least 10 spins in order to match numbers on the reel with the grid. On each spin, there is a random number automatically generated. If the number matches one on the said grid, then it is marked-off. If you are able to mark-off five numbers – be it vertical, horizontal, or diagonal – then you have constituted a slingo! There is a reason why Slingo Rainbow Riches is hailed as one of the best slingo games online. This is none other than the set of symbols which you have to look out for, so you can add them to your winning potential. Note: You should be mindful of those devils that tend to take half of your points. At the same time, go and look for Cherubs that can nullify those devils. Wishing Well Bonus –5 slingos automatically gets you here and it is where you can obtain a pirze. Cash Crop Bonus –6 slingos can get you straight into the cash crop field, which lets you choose from about 50 coins in order to unravel prizes and loads of multipliers. Magic Toadstool Bonus –7 slingos allow you to get a pick of at least 3 toadstools from 24, which essentially reveal up to 5x extra picks or multipliers. Magic Toadstool Red Bonus –8 slingos in Slingo Rainbow Riches is synonymous to more toadstools and bigger bonuses. Road to Riches Bonus –9 slingos and you can get into the classic bonus round, which has up to 500x prizes. This is especially the case as you go down the multiplier trail. Road to Riches Red Bonus –10 slingos means getting the top bonus level and it already comes with a trail that contains up to a thousand multipliers.